Cala Llonga is a complete mini-resort with a magnificent wide sandy beach which borders the picturesque bay with pine-clad hills on either side. Ibiza has something for everyone and does everything really well for tourists. This includes looking after families and children and Cala Llonga is the resort that does that best. Everything from beach activities, accommodation and restaurants are geared towards making sure families have a fabulous holiday. You would be missing the breadth of what Cala Llonga offers so very well, if you thought this was all. Near to Ibiza Town (excellent shopping and fine dining awaits, not to mention the grand old town of Dalt Vila) and Santa Eulalia with its elegant yacht harbour (both just 10 minutes either way), it's a fantastic location for couples as well. The sea is gently sloping and the gorgeous beach of Cala Llonga, one of Ibiza's biggest, is a huge arc of golden sands stretching across 200 metres and some 100 metres wide. This allows plenty of space for everyone – from clubbers recovering from the night before to a children's activities area, including a playground on the sand and a mini-amusement park with bumper cars, trampolines and more. Endless cafes and snack bars catering for the younger palate are also well considered. Although there aren't as many shops in Cala Llonga as there are in other resorts, there is still everything you could need, including a pharmacy, supermarket and shops offering everything you could possibly want as well as some great gift shops for presents to take home. During the summer season, each Thursday evening there is a small market taking place on the promenade, with a selection of stalls selling fashion, accessories, jewellery and other lovely souvenirs. Parents and couples haven't been overlooked and if teasing your toes in the sand as you relax isn't quite enough to keep you occupied there are pedalos and a diving school available. If you fancy staying dry, try your hand at beach volleyball which is a favourite on the golden sands. There are also excursions and other interesting things to do nearby. Accommodation reflects the resort's family-friendly approach and there is a host of apartments and hotels in the area, most of them just a couple of steps from the beach itself. If hard-core clubbing nightlife is still your thing, Cala Llonga isn't a lost cause as there are efficient transport links to swiftly take you to some of the best clubs on the island, including Privilege, Ushuaia and Pacha to name but three of the greats. Sleep all day in peace and quiet before hitting the best of the beats? Cala Llonga ticks that box. Locally at night, most of the entertainment is in the bars and hotels, with a strong emphasis on some really entertaining live acts to keep you occupied. Cala Llonga offers a good choice of eateries, many right on the beach or the promenade running along it, most of them open all day. Next to Cala Llonga is the small beach of Sol d'en Serra with the famed Amante Ibiza beach club, where you can watch the full moon rise over the sea as you enjoy dinner. Built into the cliffside, looking out over the Mediterranean, it has three gentle tiers of beautifully-appointed dining areas, sun loungers and chilled bars. It's not surprising that this is one of the most popular wedding locations on the island. Also near Cala Llonga are celebrated restaurants such as La Casita, a beautiful place in an old converted farmhouse with stunning valley views and Hoyo 19 next to Ibiza's only golf course, serving tasty food all day, all year round. If you wish to explore further afield by day, one of the most entertaining and relaxing means of transport is the small Tourist Train, for a fun day out visiting nearby beaches or the famous hippy markets of the island. 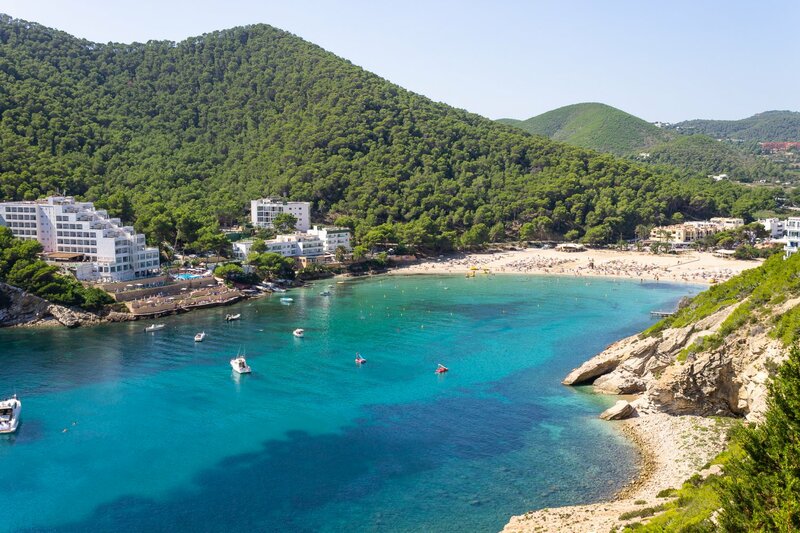 Alternatively, local ferries transport you along the beautiful coast of the island to Ibiza Town, Santa Eulalia and the Punta Arabí hippy market in Es Caná. Also well worth a day out is a trip to Formentera and the Santa Eulalia Ferry makes a stop in Cala Llonga taking you to Ibiza's beautiful sister island.